1. Amy Tangerine patterned papers (I used Peer, Twosome and Duet) 2. White gesso and watercolors (I used Maimeri White Gesso and liquid watercolors Ecolines), water and brushes, plastic card or piece of cardstock. 3. Amy Tangerine Stamps set and ink pad 4. Amy Tangerine embroidery kit 5. Amy Tangerine color markers, black pen and pencil 6. Embellishments as Amy Tangerine cotton brads, stickers, puffy accents etc. 7. Photo If you have all the supplies you can relax and have fun. Step 1: Choose the place for the photo. In that place put some gesso on the patterned paper. Put it in a way that it extends beyond the photo about 2-3 cm. Make it with plastic card as in the picture. You can use only small amount of gesso. I use gesso to prime the paper for watercolors. When it dries it will be white. Step 2: Choose colors which you want to use in your LO. I try to use colors which I find on photo. But be careful, don’t overdo it. It’s better to use less than more. As you can see I used pink watercolors in many shades – my laces are pink and flower petals also have a beautiful shade of pink. How to use watercolors. There are lots of techniques, I’m not an expert but I will tell you how I do this. Put some waterdrops with soft brush on the primed area, make some big and small splashes. Then add carefully watercolors with brush to the waterdrops which are already on the paper. To make it more interesting use few shades of color, but don’t blend them with brush. They will merge themselves in drops of water. When it dries it will make colorful cloud, almost 3D effect. Let it dry. If you’re not happy enough with the final effect you can add another layer of water and watercolors. Step 3: Prepare some embellishments and add what you want to use. Also you can make some scribbles and doodling with pencil and color markers. I used them. I made embroidery heart on the card which I wanted to use. Then added some cotton brads and "here we go” puffy sticker. At the end I used stamp and made some arrows with black pencil. And the final step is adding some black splashes, I always do that with black liquid ink. Well, that’s all. As you can see it’s not too complicated, not at all. I hope I inspired you a little bit and can’t wait to see your works. I encourage you to play with watercolors and medias. It’s really great fun, and I think that’s the most important part in scrapbooking – to have fun !!! Other Design Team member posts can be found here. 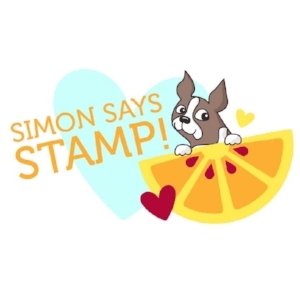 Shop for Amy Tangerine products at your local scrapbook stores and online at Scrapbook.com and Simon Says Stamp!